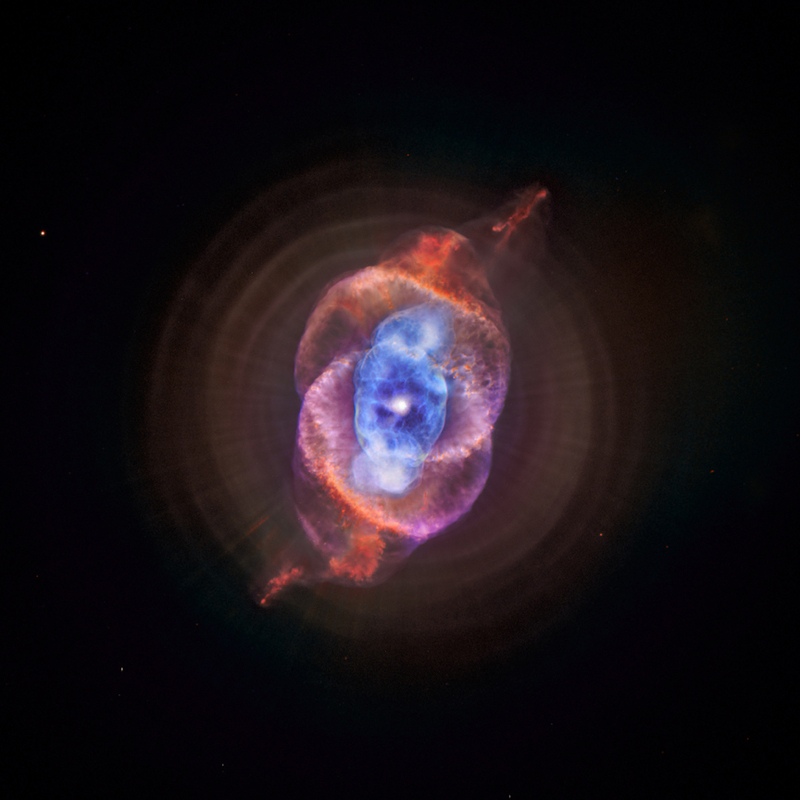 Explanation: Haunting patterns within planetary nebula NGC 6543 readily suggest its popular moniker -- the Cat's Eye nebula. Starting in 1995, stunning false-color optical images from the Hubble Space Telescope detailed the swirls of this glowing nebula, known to be the gaseous shroud expelled from a dying sun-like star about 3,000 light-years from Earth. This composite picture combines the latest Hubble optical image of the Cat's Eye with new x-ray data from the orbiting Chandra Observatory and reveals surprisingly intense x-ray emission indicating the presence of extremely hot gas. X-ray emission is shown as blue-purple hues superimposed on the nebula's center. The nebula's central star itself is clearly immersed in the multimillion degree, x-ray emitting gas. Other pockets of x-ray hot gas seem to be bordered by cooler gas emitting strongly at optical wavelengths, a clear indication that expanding hot gas is sculpting the visible Cat's Eye filaments and structures. Gazing into the Cat's Eye, astronomers see the fate of our sun, destined to enter its own planetary nebula phase of evolution ... in about 5 billion years.